No explosives were found aboard two separate Air France planes that were diverted to Halifax and Salt Lake City due to bomb threats, according to the airline. Passengers in Halifax will be put on a flight to Paris early Thursday. No explosives were found aboard two separate Air France planes that were diverted to Halifax and Salt Lake City due to bomb threats, according to the airline. Authorities in both cities thoroughly inspected both aircraft, passengers and their luggage, and nothing was found, according to an Air France release. The airline said the bomb threat that led to the diversion of Flight 55 to Halifax Stanfield International Airport was a "false alert." The bomb threats were received by telephone shortly after Flight 55 left Washington, D.C., for Paris on Tuesday. An investigation is underway to determine the source of that phone call, Air France says. Passengers grounded in Halifax will be put on Flight 4093 to continue their journey. The flight was originally scheduled to depart Halifax at 7 p.m. today, but has been delayed until 3:45 a.m. Thursday. Passengers aboard the plane that was diverted to Salt Lake City have already arrived in France. The company says the passengers in Halifax are being accommodated. 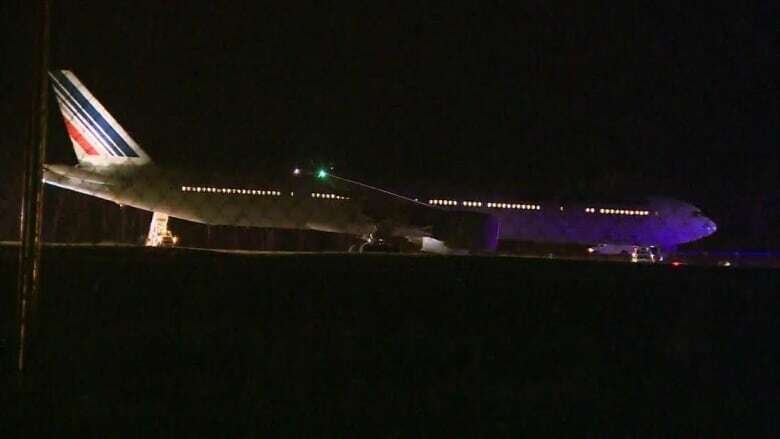 Two hundred and sixty-two passengers and crew were aboard the Boeing 777 when it landed in Halifax around 10 p.m. Tuesday night. RCMP searched the plane using police dogs trained to detect explosives. Shortly after 3 a.m., no explosives were found in a search of the plane and luggage. The plane was released from police custody. It took an hour and 15 minutes to remove passengers by buses provided by Halifax Transit. The main runway at Halifax's airport was reopened at 4:15 a.m. Wednesday and the plane was moved to a gate. There are no plans to increase security at the Halifax Stanfield airport, according to spokeswoman Ashley Gallant. "We are always very vigilant here with our security program. We take direction from our partners, whether it be the RCMP or CSIS, for example, whether we up our security," she said. "If they notify us to increase our security measures, we will. Up at this point, there hasn't been, so we will continue to monitor the situation and work with those partners." Peter Spurway, a spokesman for the airport, said the passengers and crew aboard Flight 55 were taken to "a secure area in the airport terminal." All were interviewed by RCMP. Spurway said the airport was trying to make passengers as comfortable as possible. Air Canada, on behalf of Air France, helped find accommodations overnight for the passengers and crew. Spurway said the Halifax airport is prepared to deal with diversions, adding it had already handled three or four diverted flights this month. This was Flight 55's flight path, showing it being diverted to Halifax.